Deep and Dark, this full bodied stout lives up to its name. I thought this might be a dryer stout, but I was pleasantly surprised by its sweetness. A nice malt sweetness balanced by a little bitter oakey, tannin, hop, almost piney bite. Being a 2010 vintage, the alcohol hotness imparted is huge, as strong as a tile cleaner aroma . I could have aged this one for a few more years and I am sure it would have mellowed a bit. Truly an excellent stout, with a tiny fruity sweetness and slightly detectable molasses notes. If I pick up another one I think I will age it at least four years. 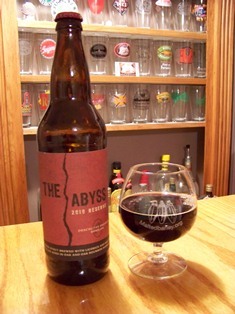 Overall I would say that The Abyss pretty much epitomizes what an Imperial Stout should be. Rather balanced, if I could brew a stout this good my experimenting days would be over. This page contains a single entry by Brewmaster published on February 19, 2012 7:18 PM. Brewing New York's History at the New-York Historical Society was the previous entry in this blog. 2012 MBG Winter Beer Festival is the next entry in this blog.